Our production company is certified in accordance with ISO 9001:2008. In addition, our products are CE certified. An EC declaration of conformity (Directive 2006/42/EEC, Annex II, section A) is provided on the condition that all components, accessories and control boxes are supplied by Dockequipment.eu and are installed according to the installation instructions, by qualified personnel. 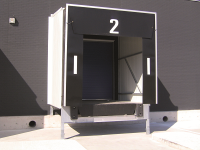 Our docklevellers are produced and used in accordance with EC 1398-1:2008. Our wide range of dock equipment products are designed according the highest quality standards, using the most modern production technology. This enables us to offer a consistently high quality of our products.